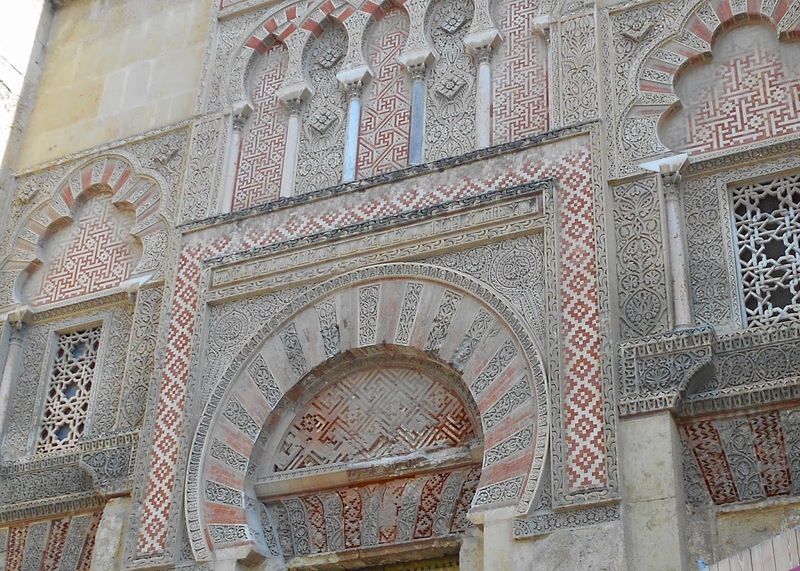 Decoration on the exterior of the surrounding wall foreshadows what one will discover inside the gates. 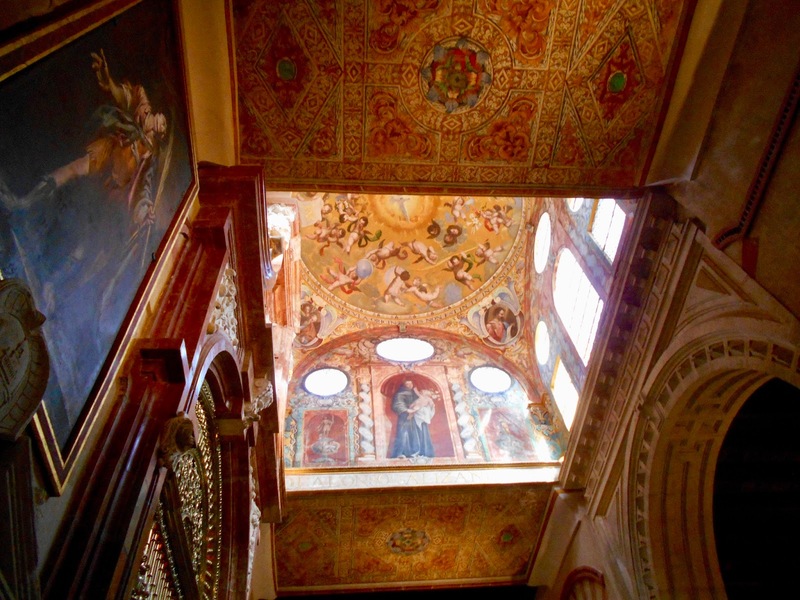 Admission tickets and audio guides are purchased at two separate kiosks inside the spacious gardens. 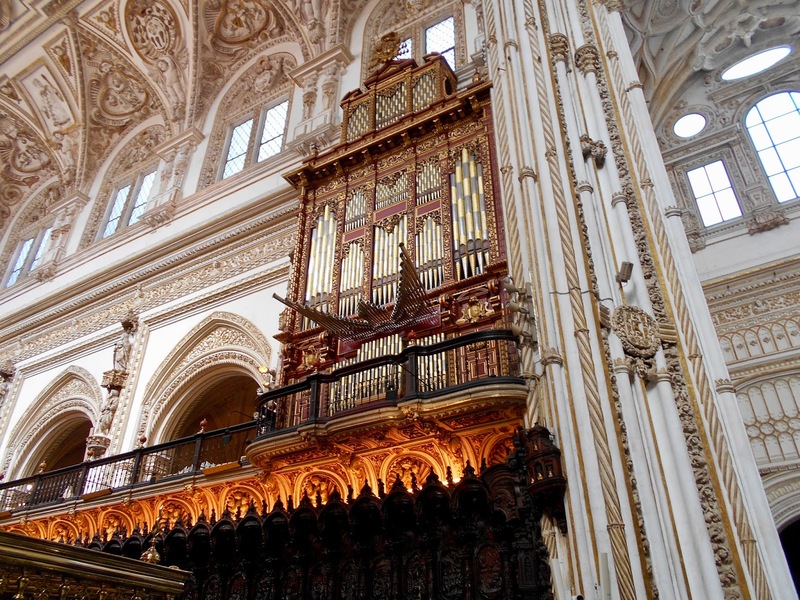 Oddly, one cannot get the audio without a ticket in hand, so that both complicates and slows the process. It's all somewhat confusing and the cues (visible below) are long, but eventually one realizes to just go with the flow! Audio guides dangling around our necks and tickets in hand we step inside the mosque and are overwhelmed by the intricate patterns and paintings. 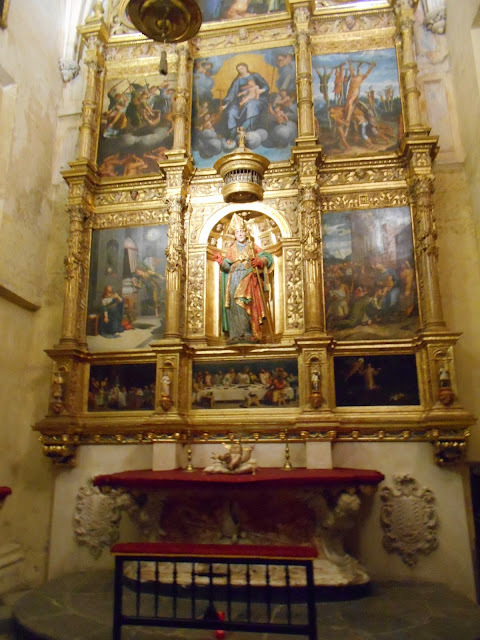 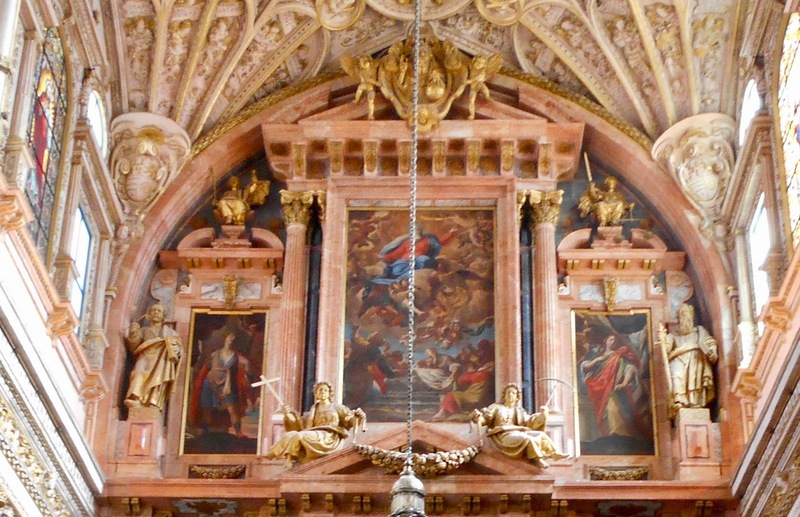 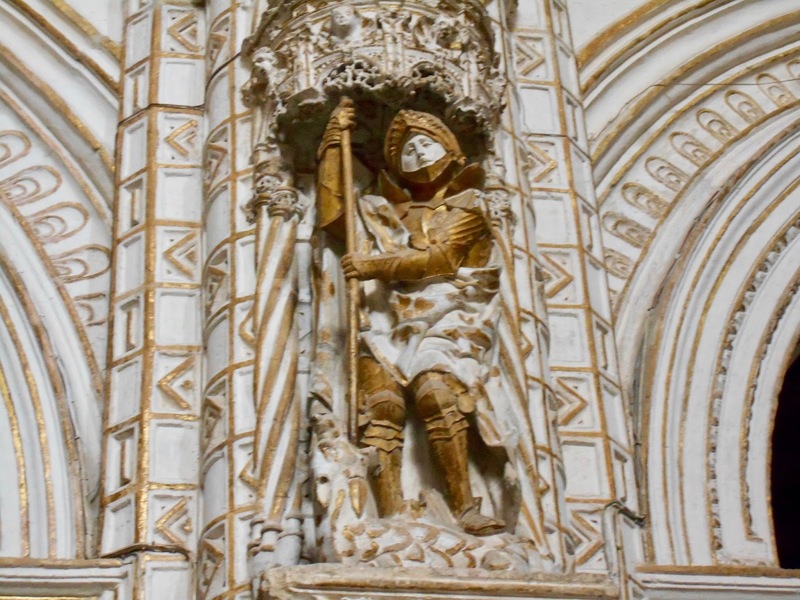 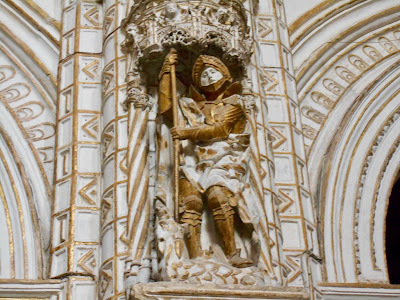 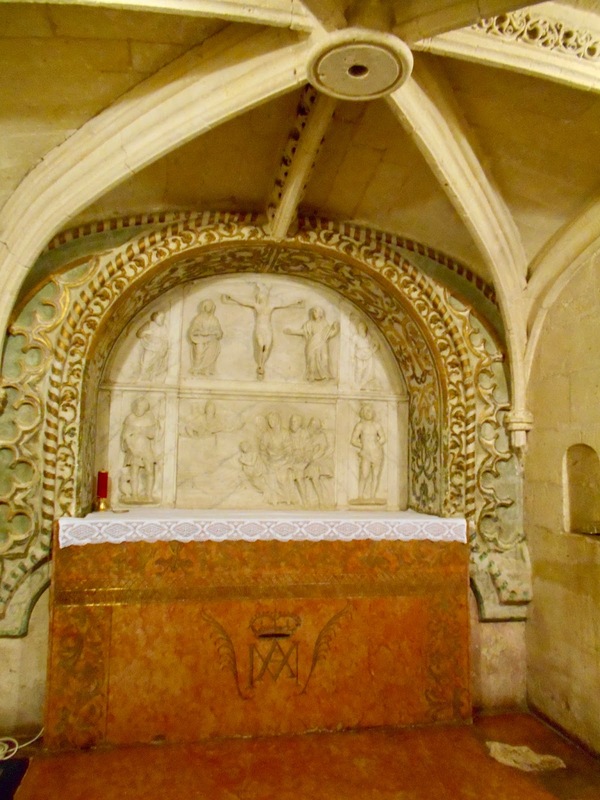 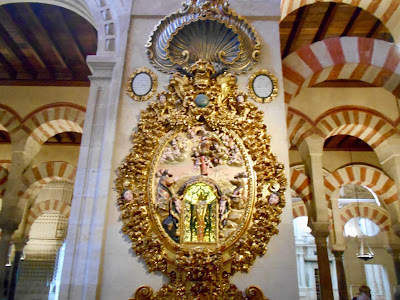 With all of these Christian saints and images one forgets its Moorish past. 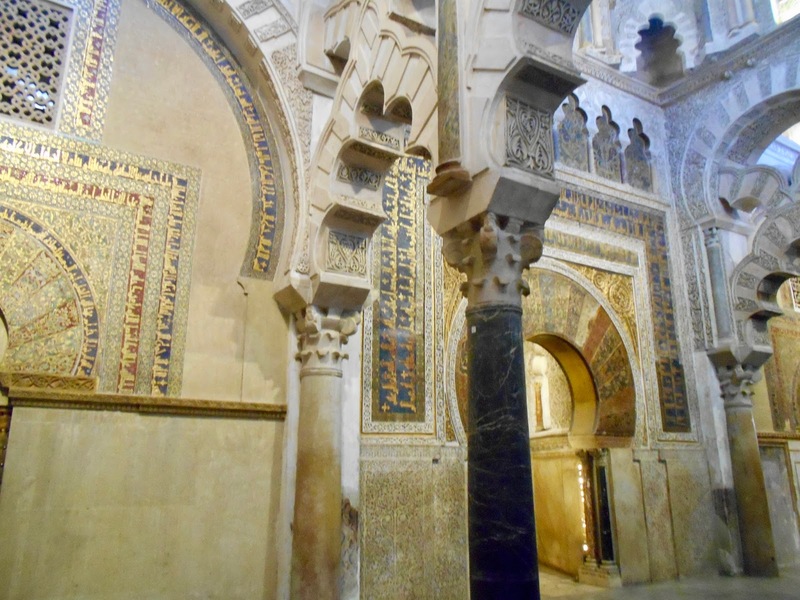 Then, one turns around and beyond the gold and glitter are the magnificent 856 coloured granite jasper and marble pillars. 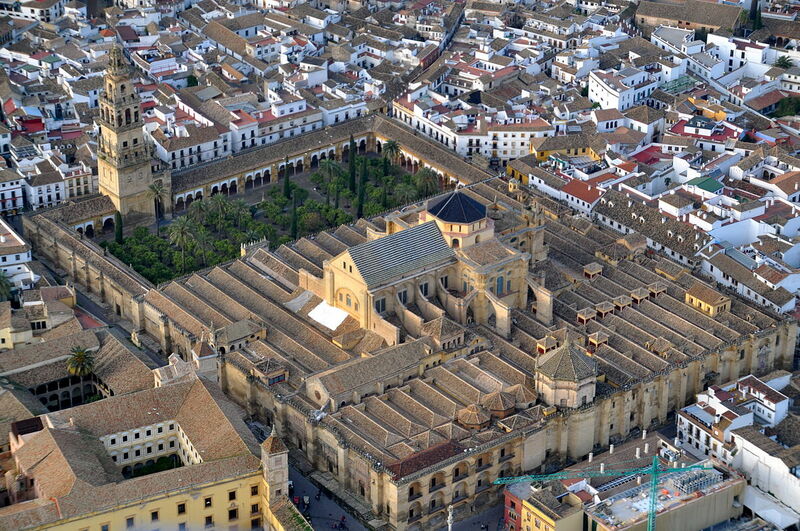 At 258,333 square feet and said to be able to hold 40,000 people the mosque-cathedral's size is mind boggling. 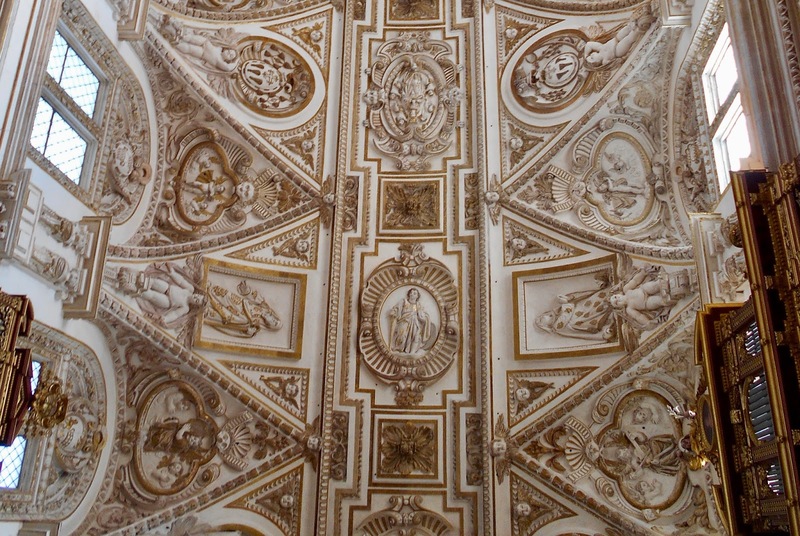 It's almost impossible to see from one end to the other. 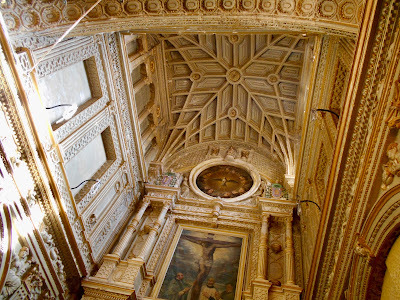 Meanwhile, overhead the beauty of the architecture inspires and awes. 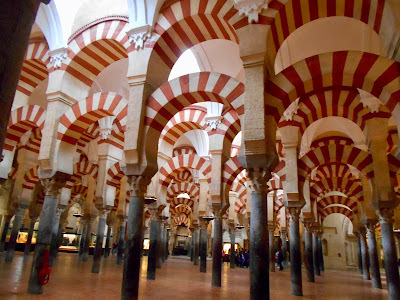 All along the outer perimeters are a series of chapels. 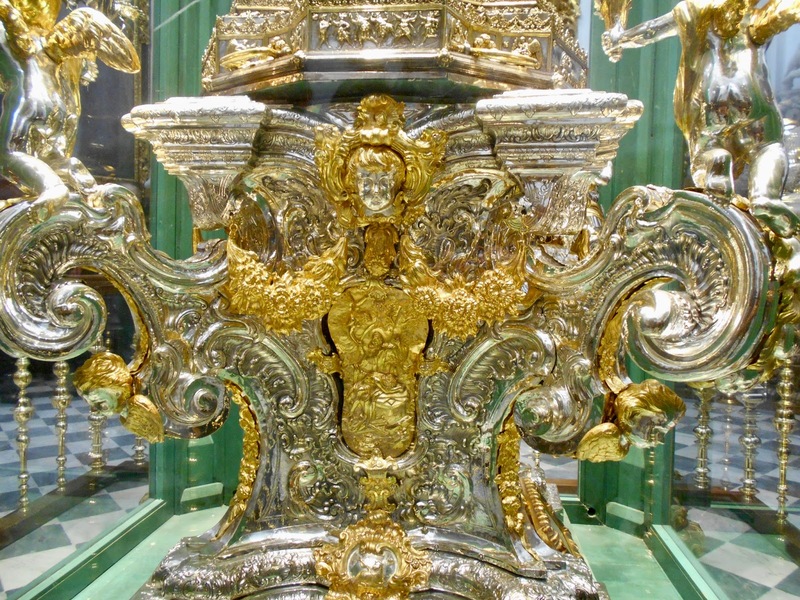 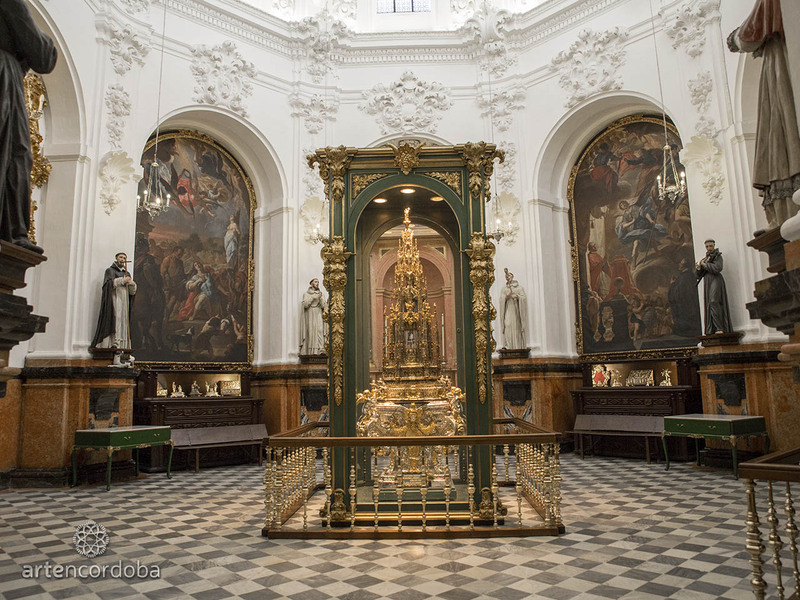 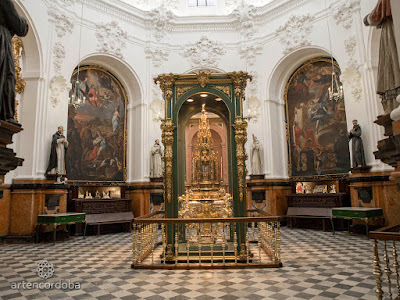 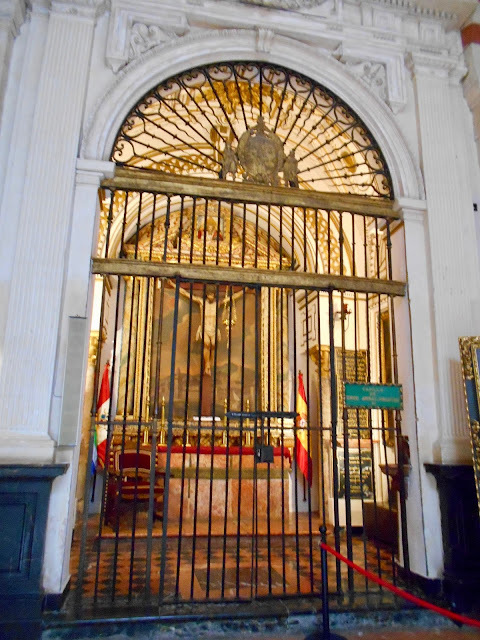 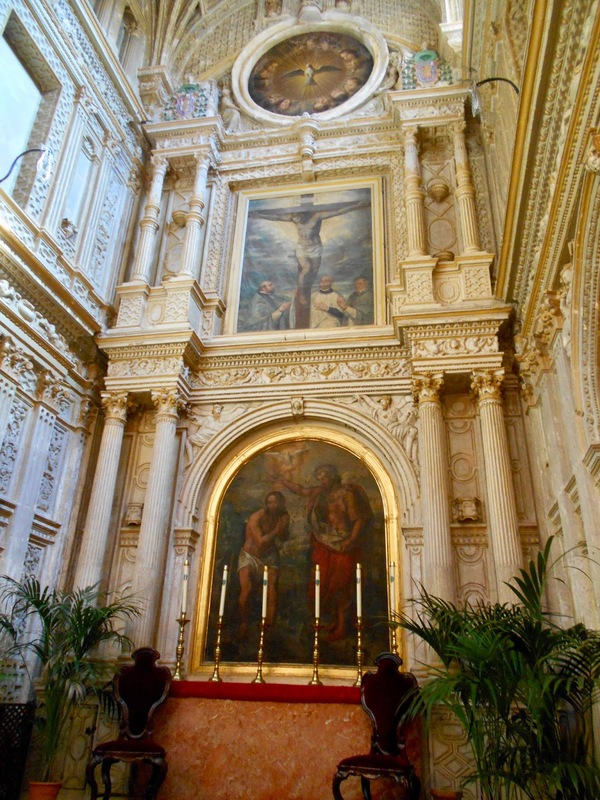 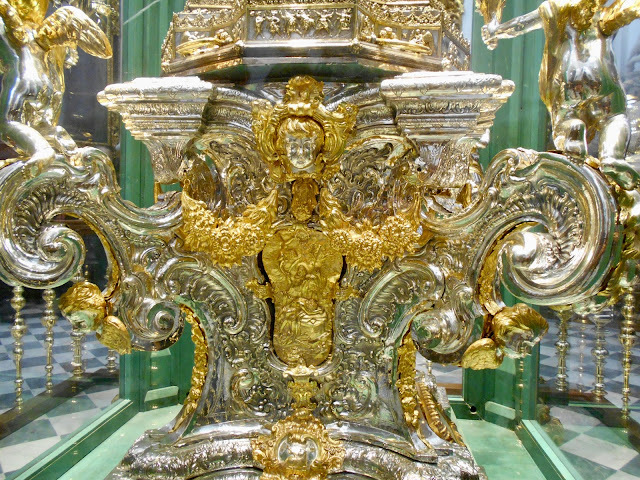 This particular chapel, dedicated to Saint Theresa, houses a gold monstrance. 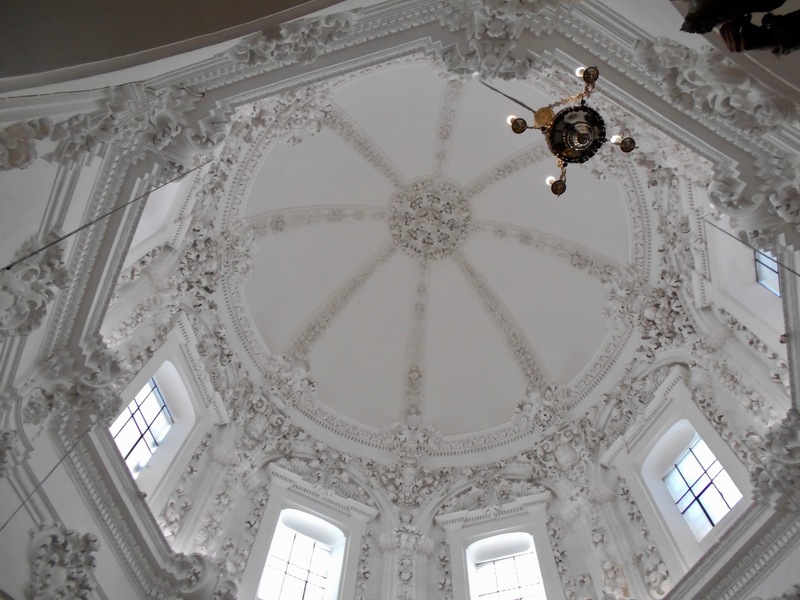 The white domed ceiling is equally impressive. 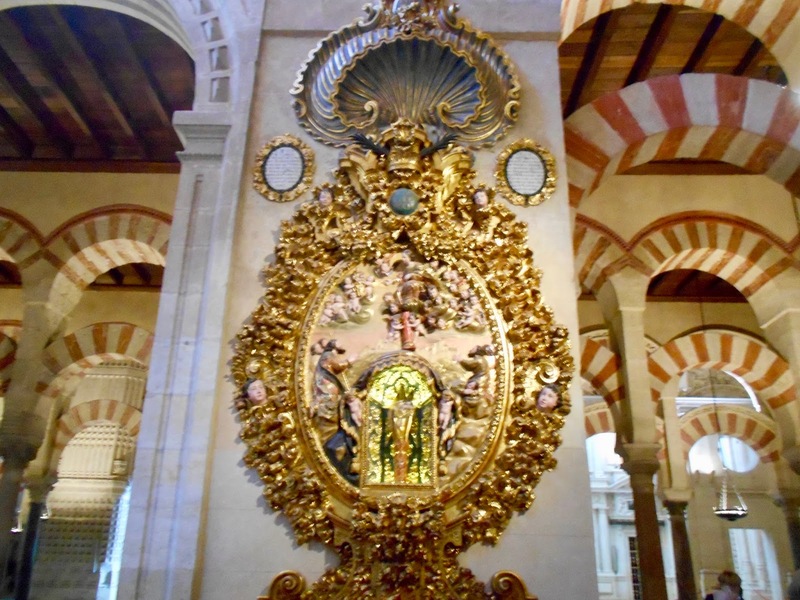 Then, after contemplating this is the most amazing thing one will ever likely experience in a lifetime we came face-to-face with the cathedral. 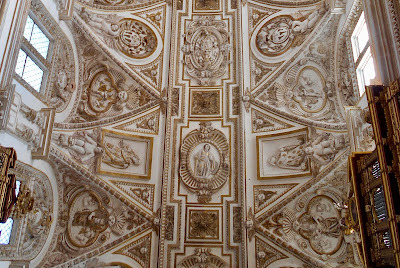 It is unlike anything we've seen before. 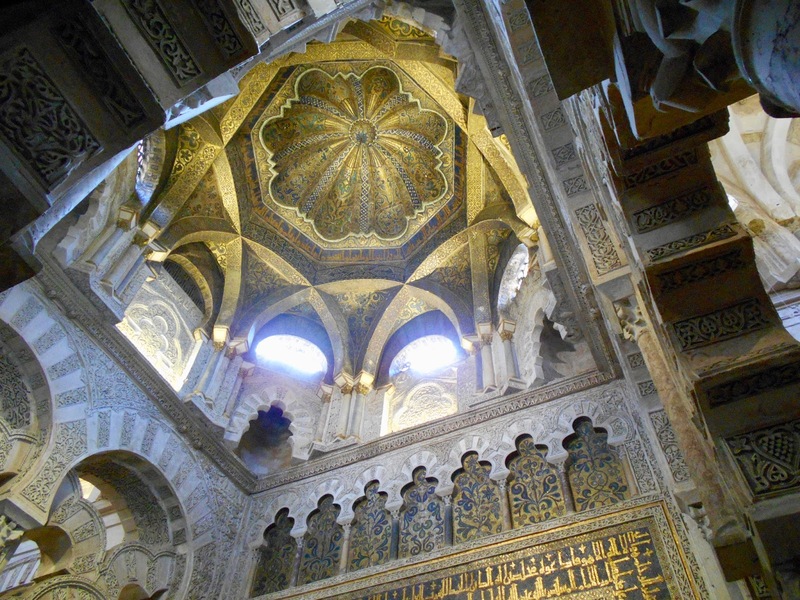 Its detail, size, glitter and glitz are utterly breathtaking and all the more impressive because it is smack dab in the centre of a mosque! 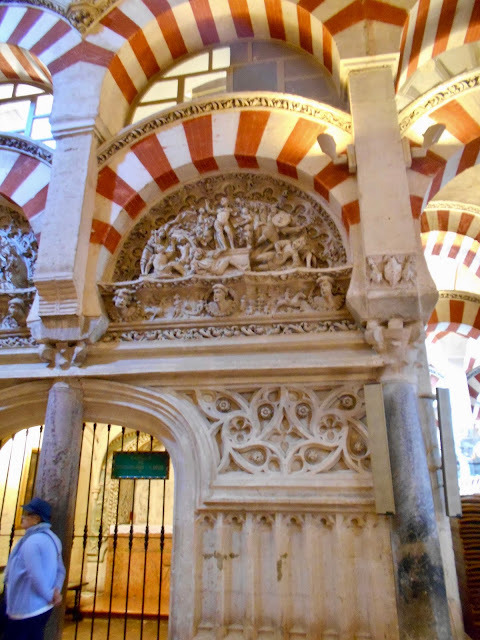 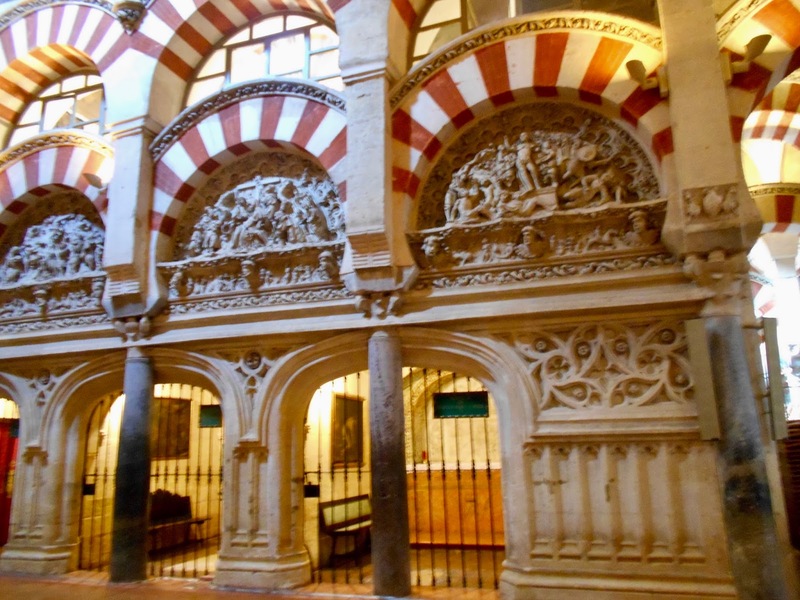 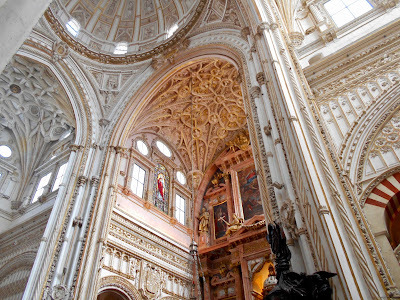 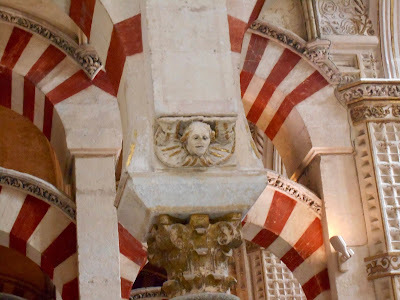 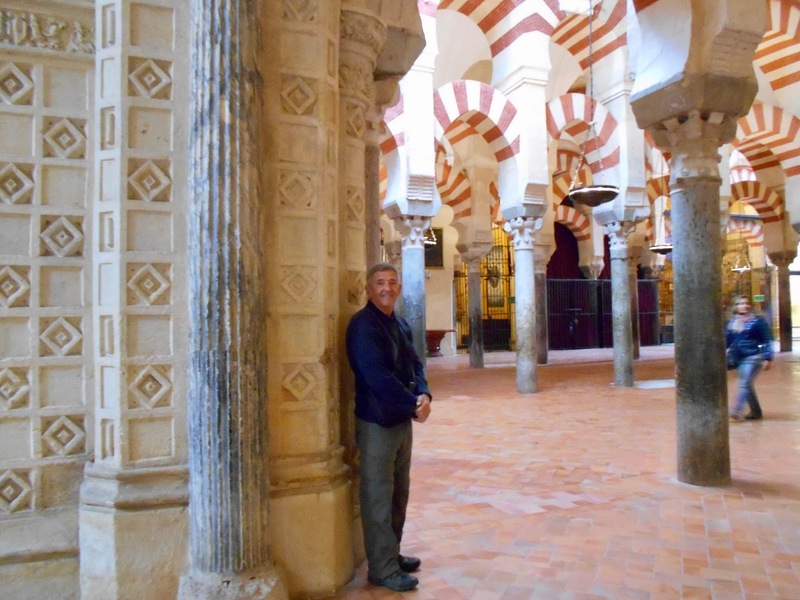 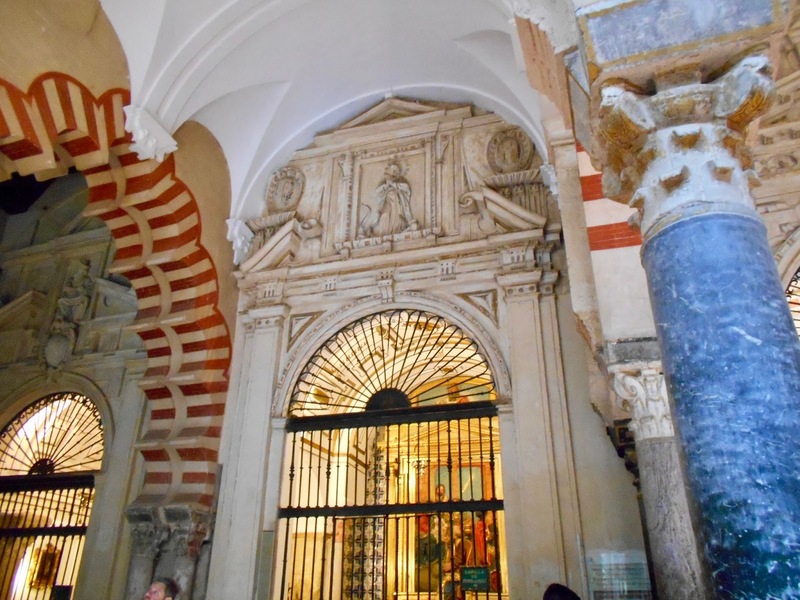 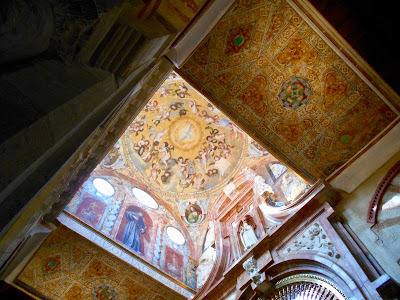 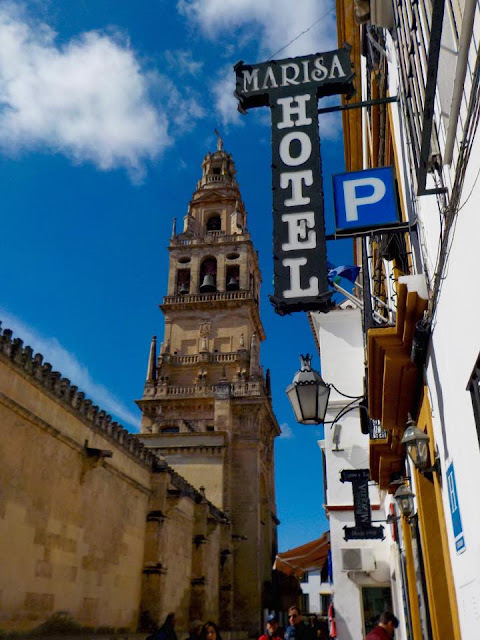 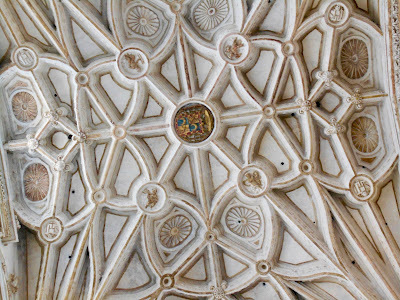 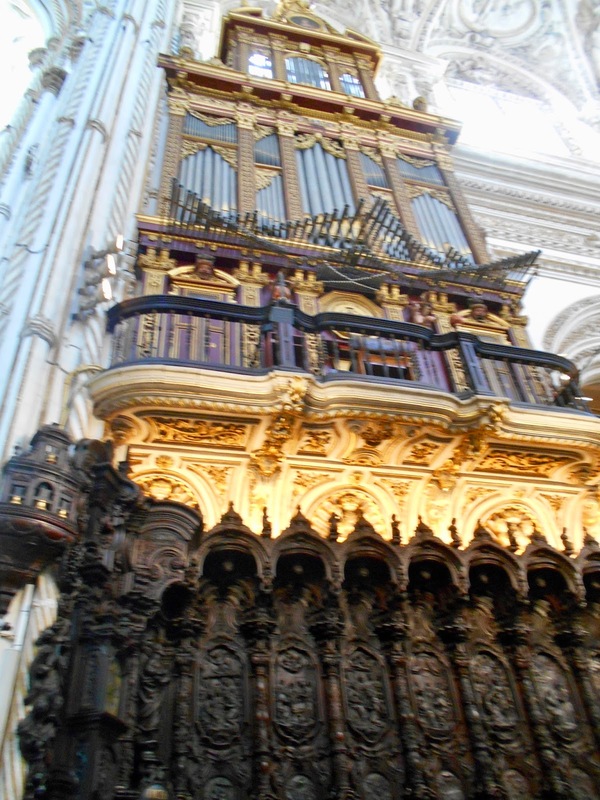 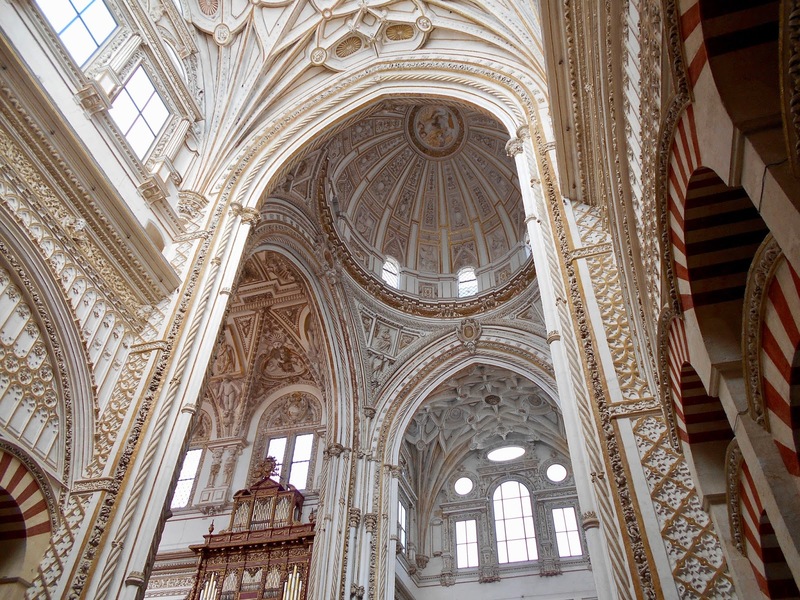 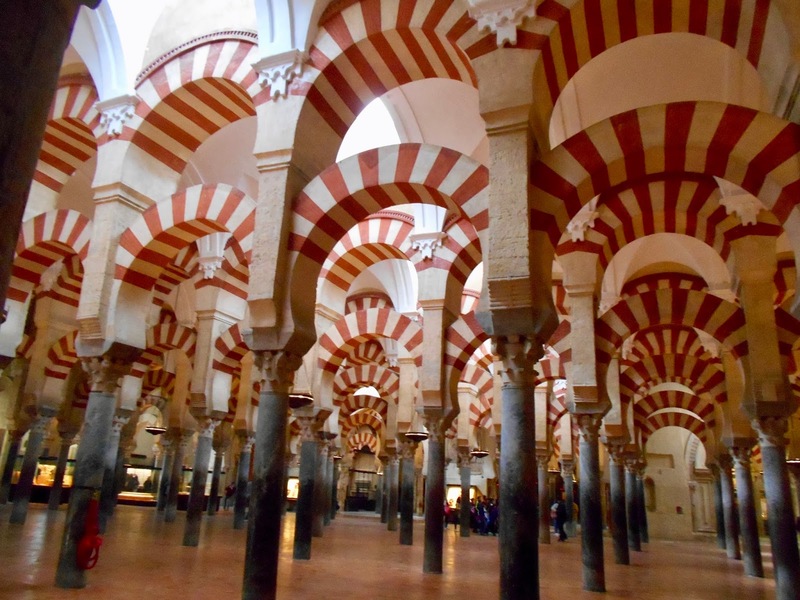 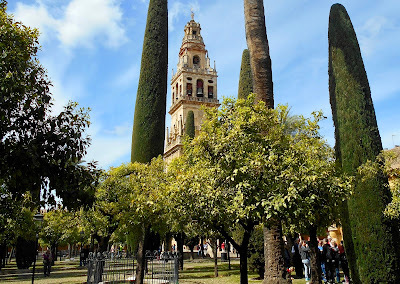 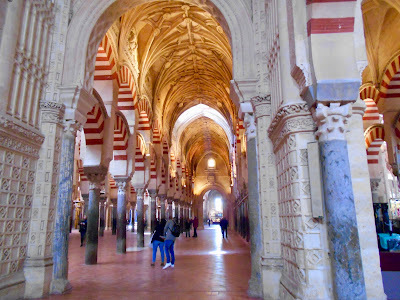 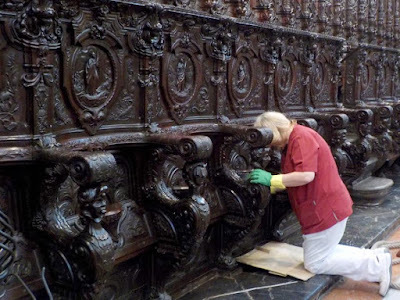 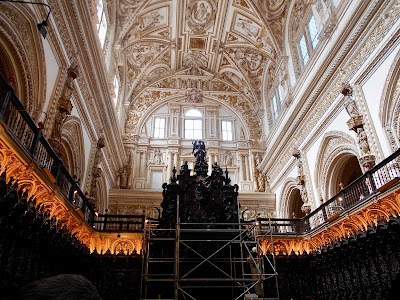 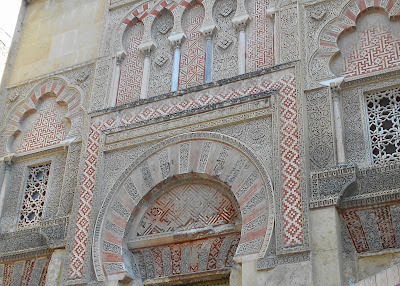 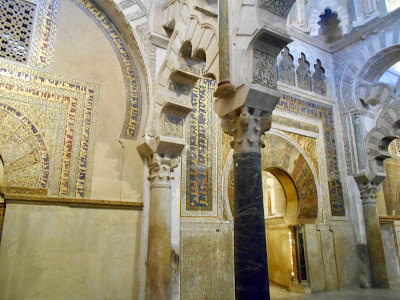 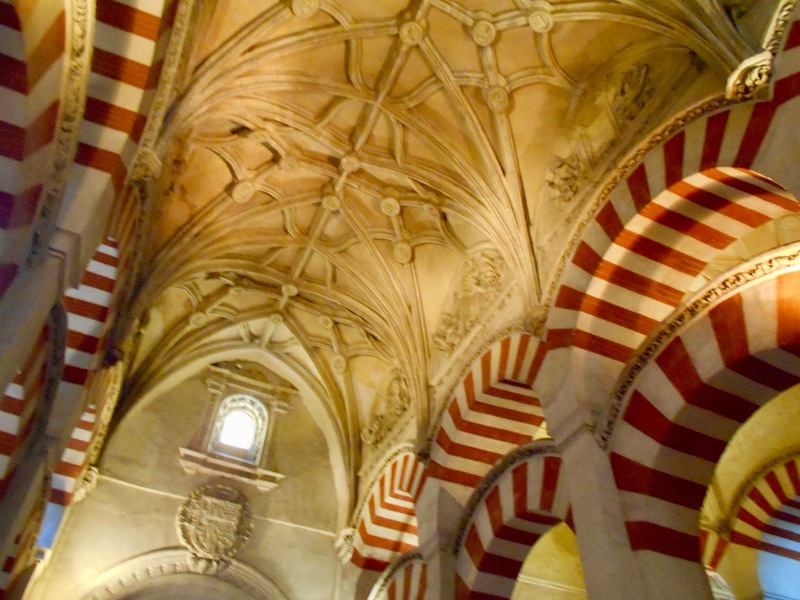 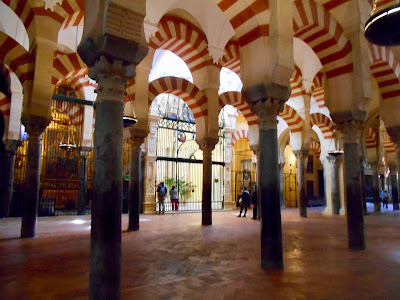 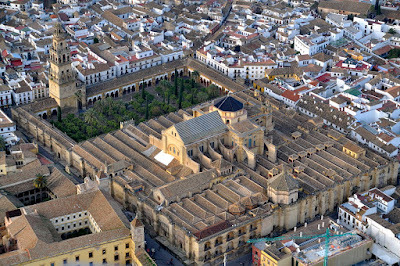 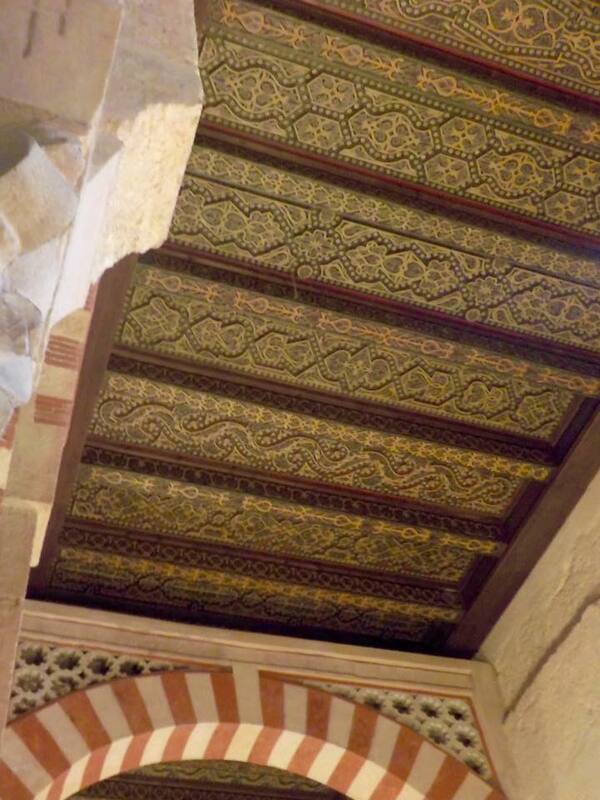 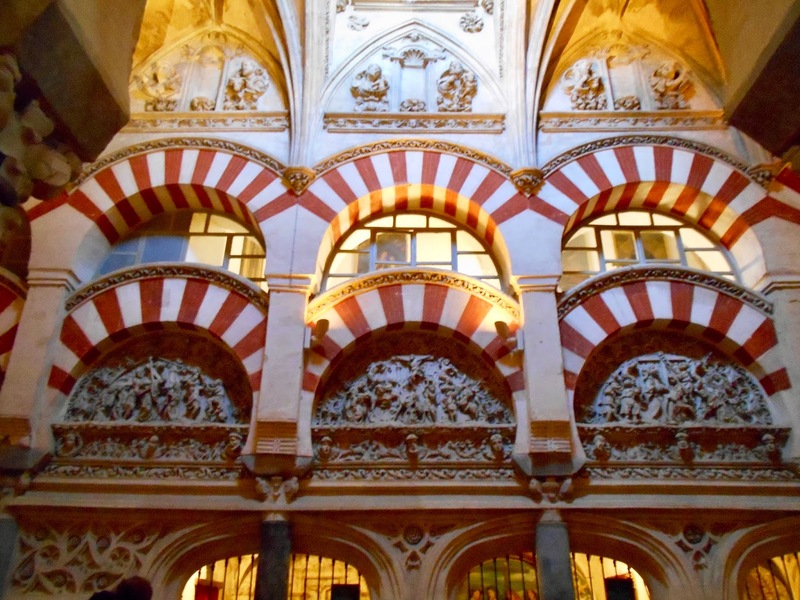 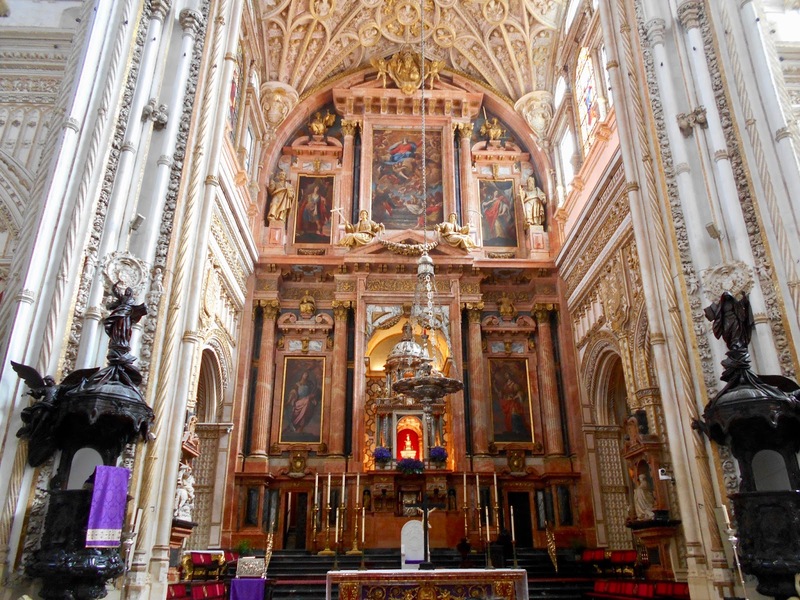 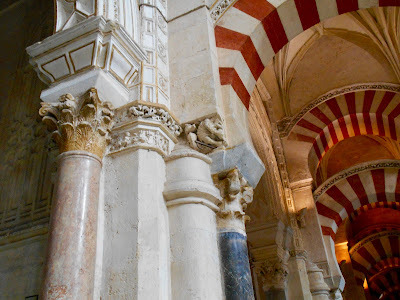 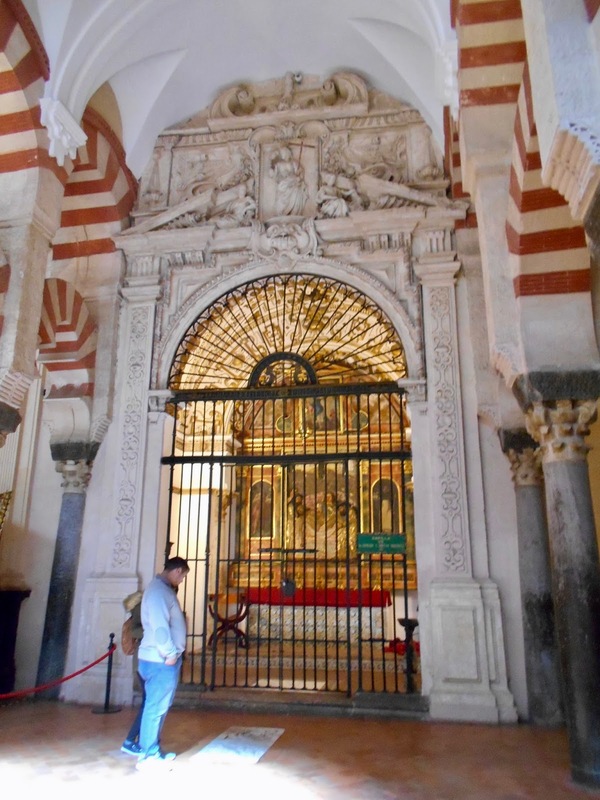 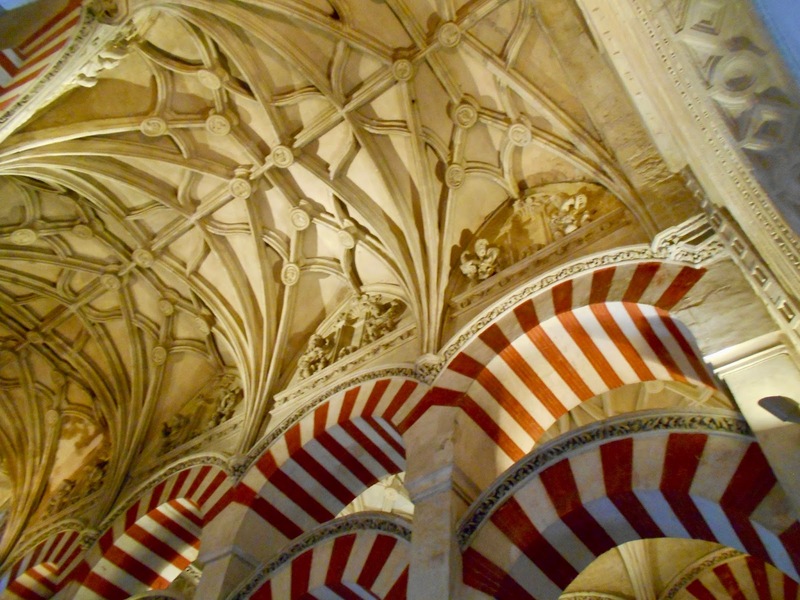 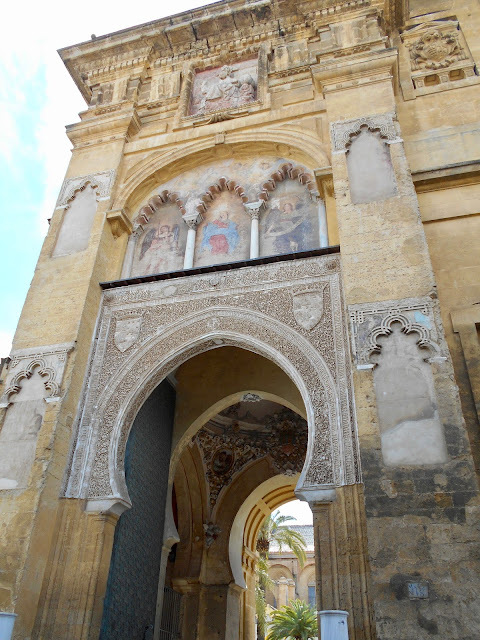 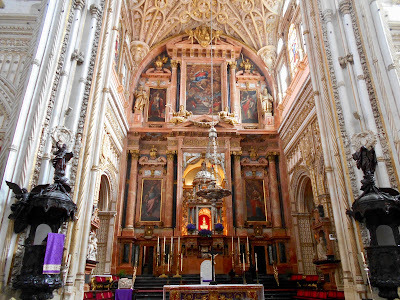 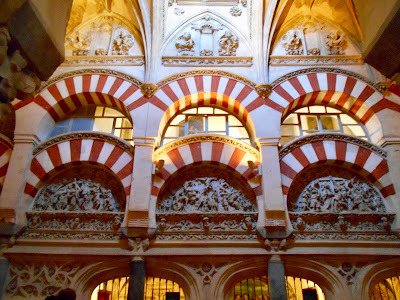 It seems fitting that in 1984 the mosque-cathedral and historic centre of Cordoba became a UNESCO World Heritage site. If time allows we'd love nothing better to return and once more experience the grandeur of this amazing structure.